There are so many ways you can decorate with stencils for nursery. Here are a few ideas and some wonderful stencils that come in book collections so that you can follow a theme for your new arrival. Stencils are there for those of us who can’t just slather a brush in paint and end up with art. They are great for putting images where we want and sometimes in spaces that aren’t easy paint. Here are some ideas for your decorating project. 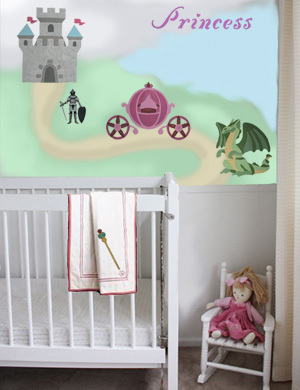 Creating a mural with Wall Stencils Nursery is probably the number one way to create a unique space for your little one. Let’s face it. Painting a mural really makes any room personalized. But for most rooms finding the right theme is difficult. But for a nursery, it’s just difficult to decide on the stencils. Don’t worry about painting Stencil Wall Murals. Maybe it’s a bigger project than you were planning but it’s easy with stencils. In fact, you’ll find a quick video about how to do this near the bottom of this page. What little girl wouldn’t feel like a princess in this room? Here are some simpler ideas for your stencils for nursery plans. 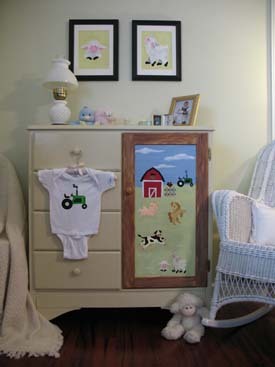 Consider transforming an old piece of furniture into a wonderful addition to the nursery. Furniture Painting is a wonderful way to bring the theme you choose into the room and it’s easy with stencils. Not to mention that by making over an old piece of furniture you can save a lot of money. So you get a unique piece of furniture and save money! Notice the art prints above the armoire? Well they were done with stencils for nursery patterns too. It’s real easy to create Stencil Art and frame for hanging. And you’re art is a perfect match to everything else. OK! What about the little garment hanging from the drawer pull. The tractor is a stencil from the book. Just click over to How To Garment Stenciling for more about this idea. We are thrilled to introduce our selection of downloadable and printable Stencil Designs. Instant gratification at its finest! You don't need a special printer - these designs are specially formatted to print straight from your home computer on standard letter sized paper. Once downloaded, you will have your complete stencil booklet with patterns and instructions. Just click, buy and print! 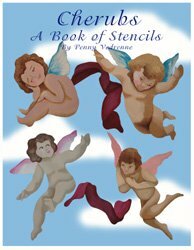 The books below have a variety stencils for nursery. Each book will come to you as a downloadable pdf file in your e-mail. Just check your e-mail after purchase for the link to connect to your file and print or save. It's that easy! Click on the picture for Project Ideas! Create your own private garden retreat with this mural stenciling collection which includes 12 designs including 4 animal stencils -fountain, bleeding heart, iris, bee, butterfly, foxglove, grasshopper, hummingbird, trumpet flower, morning glory, stone wall and stove path. These designs are great stencils for nursery or any other room. This book contains 4 cute Red-Eyed Tree Frogs for you to paint in your mural stenciling project. Bring a little of the rain forest to your home by using these frogs. As stencils for nursery they can add a vibrant splash of color. There are 37 pages in this pdf file which includes the stencils of all 4 frogs (each has 5 overlays) and complete instructions. This collection includes 4 designs- Daydreaming Cherub, Watching Over You Cherub, Welcoming You Cherub and With All My Heart Cherub. Imagine mural stenciling these on the ceiling with a blue sky, a few clouds and these cute Cherubs. This purchase is of a PDF file with 36 pages. Well, here's the video I promised you. It's just a very short version of the hour long tutorial available at Stencil Wall Murals. I hope you get some great ideas about Mural Stenciling! Hey! Don’t forget that I (and everyone else) want to see what you have done with your Stencils for Nursery Patterns. Just click on Stenciling Projects to get your masterpiece showcased here on this web site. Won’t that be exciting! Or if you have any questions or want to share information join in on the Stencil Blog. Well, I hope to hear from you soon. Return to Home Page from Stencils for Nursery. Return to Crafts for Kids from Stencils for Nursery.